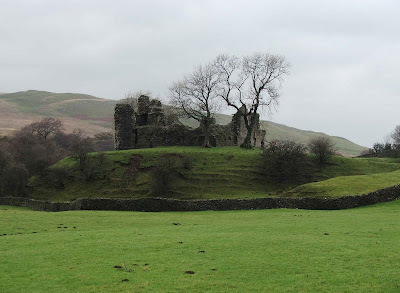 Here's a brief introduction to Pendragon Castle and Lammerside Castle\Tower. Travelling out towards Kirkby Stephen, and turning onto the B6259 to Nateby, takes you into the beautiful valley of Mallerstang. Within this valley, and from the surrounding Wild Boar Fell and Black Fell Moss, two becks, Red Gill and Little Grain join forces to form Hell Gill Beck. After flowing gently over the open moorland that is so typical of this part of the county, and over Hell Gill Force waterfall, the beck becomes a fully fledged river…..the river Eden. The river, for much the length of the valley, winds alongside the road, both vying for space at the bottom of the valley. Along this valley lay two interesting pieces of defensive history. 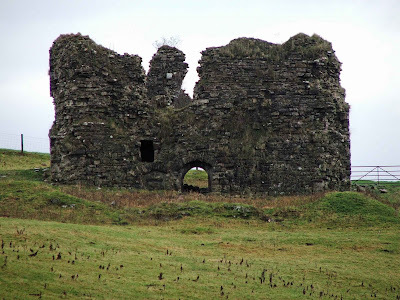 The first is the picturesque and history steeped castle of Pendragon. The second is the isolated Lammerside tower. Mallerstang, as with much of Cumbria, was in the past vulnerable to Scottish raids. Hence the number of castles, pele towers and fortified houses, manors and halls. Pendragon Castle is a small moated fortification sitting alongside the River Eden. The castle is a tower some 20 metres square, with thick walls, measuring anything up to 4 and a half metres thick in places. It stands in the centre of a raised earth platform, surrounded with ditches around 3 metres deep and some 10 metres wide in places. There are the remains of two causeways traversing the moat. After an accidental fire in 1541, the castle was taken up by Lady Anne Clifford, who restored and rebuilt it during 1660 and 1661. After her death, it was dismantled by the Earl of Thanet, with materials being used in his castle at Appleby. The castle is now ruined, but access can be had to the inside, where you will find yourself walking over mounds of roof rubble. Lammerside is a different building altogether. 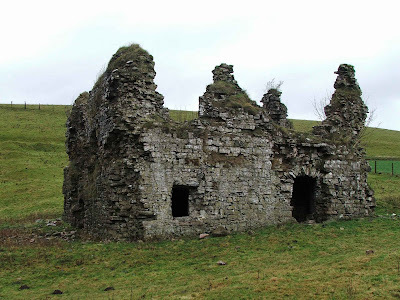 The remains that can be seen today probably date from the 14th century, and the single ruined tower was probably the solar wing of a complex of building here by the side of the River Eden. The tower measures around 14 metres by 11 and a half metres, with walls some metre and a half thick. This was obviously not as fortified as Pendragon, but would probably have had a barmkyn surrounding the complex, instead of a moat as at Pendragon. The tower now only stands to the first floor height, with some of the first floor still intact (although the staircase to this floor has collapsed and it isn't accessible) However...if you walk about 50 yards up the hill, it is easy to see the first floor of the tower....binoculars or a camera with a zoom will help to see the features here. The interior of the tower can be accessed, but it's dark and full of rubble, and sometimes dead sheep...so care should be taken. Both of these sites are covered in more detail elsewhere on this blog.